Sleep easy, MetroCard-carrying brethren, for our fearless police force has finally decided to turn the shining light of Justice™ into Gotham's darkest, most dangerous corner of criminality. That's right: subway churros. The NYPD has declared war on them. Soon our subway platforms will be as safe as our streets, which are extremely safe. Reports DNAinfo, the 2015 offensive against illegal ethnic pastry began on March 28th, when police bravely stopped three hardened criminals from flagrantly dealing their sugary wares -- a bona fide danger to civil order, if there ever was one -- amidst the bustle of the Union Square subway station. 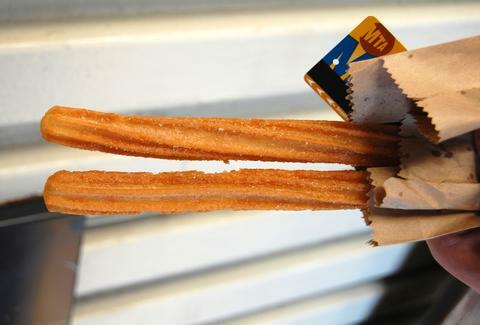 "An officer spotted the first woman selling a churro to one commuter in exchange for $2... and arrested her [...] the third was collared for the same violation at about 11:55 p.m." Such courage! The heart flutters. The site says that between 2013-2014, one of the women was arrested seven times for breaking the same dessert law -- quite a streak of disregarding community safety. Good thing the cops caught on to her tricks. But it doesn't stop there. The NYPD, having already adequately preserved peace in every other facet of city life, made examples of these lawless churro barons by destroying their contraband. "Once police arrest[ed one 43-year-old churro vendor], they confiscate[d] the churros and [took] her to the local precinct, where she’s had to watch police officers eat her churros in front of her." DO YOU HEAR THAT, VILE SUGAR-PUSHERS?! Take your unlicensed churros and go screw, 'cause the NYPD is here to protect, serve, and send a goddamned message. Dave Infante is a senior writer for Thrillist, and feels a lot safer now. Follow @dinfontay on Twitter, Instagram, and Snapchat.